This week Humberside Police are backing a national drive to encourage everyone to Take Five to help prevent you becoming a victim of fraud. If you receive a request to hand over (or do something else with) personal or financial information, you need to take a moment to reflect and step back from the situation. Even if the caller or emailer say they’re the bank, police or another trusted organisation, you still need to take the time to stop and think about what’s really going on. 1) Never disclose security details, such as your PIN or full banking password – banks or other trusted organisations will never ask you for these in an email, on the phone or in writing. Before you share anything with anyone, stop. Then pause to consider what you’re being asked for and question why they need it. Unless you’re 100 per cent sure who you’re talking to, don’t disclose any personal or financial details whatsoever. 2) Don’t assume an email or phone call is authentic – just because someone knows your basic details (such as your name and address or even your mother’s maiden name), it doesn’t mean they are genuine. Be mindful of who you trust – fraudsters may try and trick you into their confidence by telling you that you’ve been a victim of fraud. Fraudsters often use this to draw you into the conversation, to scare you into acting and revealing security details. Remember, fraudsters can also make any telephone number appear on your phone handset so even if you recognise it or it seems authentic, do not assume they are genuine. 3) Don’t be rushed or pressured into making a decision – under no circumstances would banks or other trusted organisations force you to make a financial transaction on the spot; they would never ask you to transfer money into another account for fraud reasons. Remember to stop and take time to carefully consider your actions. Banks or other trusted organisations won’t rush you or mind waiting if you want time to think. 4) Listen to your instincts – if something feels wrong then it is usually right to question it. Fraudsters may lull you into a false sense of security when you are out and about or rely on your defences being down when you’re in the comfort of your own home. They may appear trustworthy, but they may not be who they claim to be. 5) Stay in control – have the confidence to refuse unusual requests for personal or financial information. It’s easy to feel embarrassed when faced with unexpected or complex conversations. But it’s okay to stop the discussion if you do not feel in control of it. 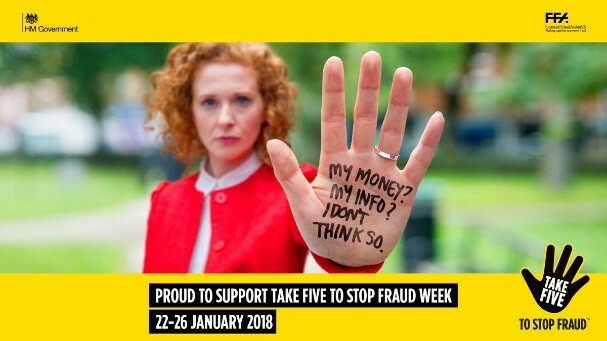 Take Five, a national campaign led by Financial Fraud Action UK Ltd, is here to take action against the financial fraud that affects millions of people in the UK each year.